Users who have a CSU Staff or Student login can be added to your site in various roles to allow for collaboration. You might want to add a user if your blog is private and only visible to registered subscribers, or you’d like to have others contribute content. As an administrator of your blog, you can add other registered users (users who have already logged into CSU Thinkspace with their CSU MYID account). 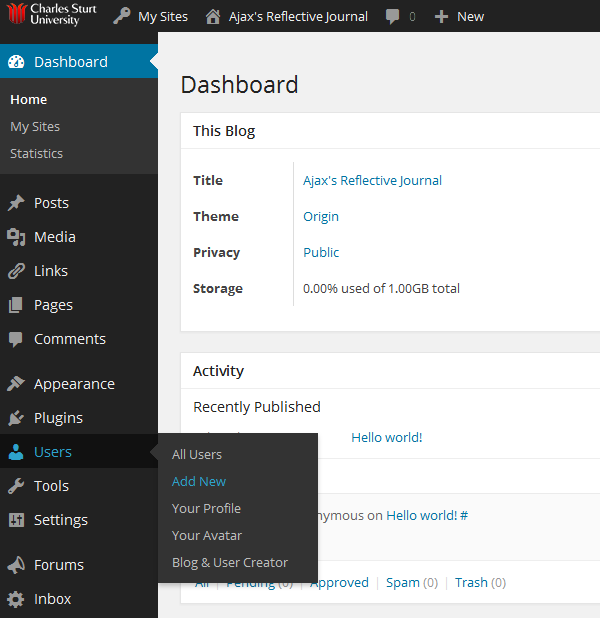 To add a user, click rollover the Users Tab on the Left -Hand Sidebar and choose ‘Add New’. In the ‘Add Existing User’ section type in the email address or username of the user you wish to add. Select the role you would like to give them and click on the ‘Add Existing User’ button. You should carefully consider which role you assign to other users since Administrators are able to remove other users, including you, and editors can delete content.